As far as award bookings with domestic carriers go, United is one of the most straightforward. You have all the options you’d expect one ways, multicity tickets, unlimited less-than-24-hour stopovers and you’re able to make almost all bookings online without any inexplicable system glitches keeping you from seeing the seats you’re entitled to cough, cough, Delta. What are United Awards Great For? This post is the second in a series on how to book award flights with the major domestic carriers. Read about how to book award tickets on Delta here. 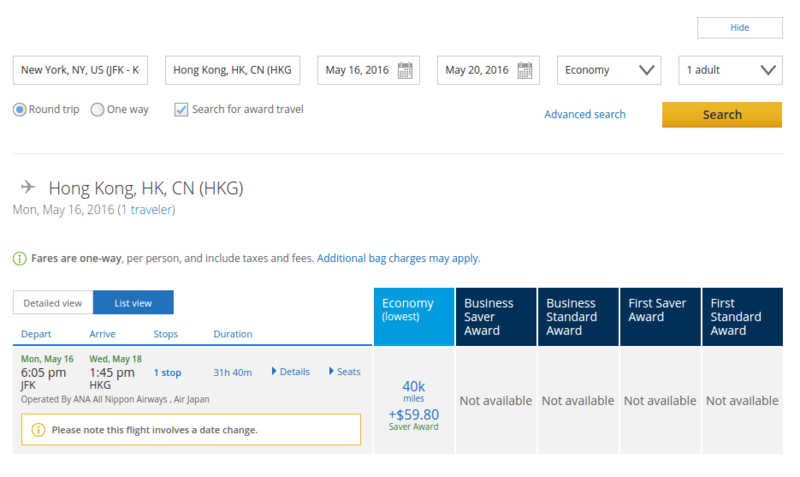 For many destinations, United’s award redemption rates aren’t any more attractive than most domestic carriers, but if you’re looking to go to Asia, United has really got you covered. Redemptions for North Asia, Japan, and Oceania (one of the most expensive places in the world to fly to on a revenue ticket) start at 35,000 miles one way, just a bit more than a flight to Europe. United has some of the most flexible awards out there, permitting two open jaws and one stopover, so its not that difficult to expand one long-haul United award into something that rivals an around the world ticket. Combine this flexibility with one of the widest partner networks 36 partner airlines connecting to more than 1,000 destinations and you’ve got a very powerful award. You can also use these perks to easily add free one-ways to your awards. Even better? Most partner flights are bookable online at the saver (lowest) award redemption rate. 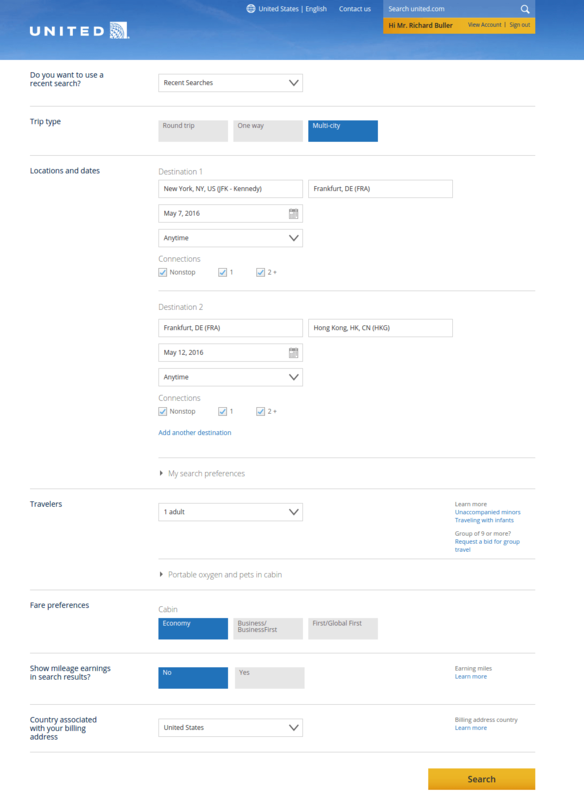 Use advanced search and set the number of flights to display to 50. This allows you to see partner and United flights on the same screen. As you search for each segment, you’ll see a calendar suggesting what types of awards are left for each day. Don’t trust it. Click on the day you want and comb through the flights manually. For international itineraries, find your flight across the ocean first. This will not be from your home city to your destination city, but from the international gateway in the U.S. to the international gateway for United or one of its partner airlines, such as Frankfurt for Lufthansa. Find seats from your home airport to the U.S. international gateway. This is a great time to slot in a long layover in a city that you want to visit, either by having a stopover on the way to the gateway or in the gateway itself. Slot in the flight from the international gateway in your destination region to your final destination. This will typically be on a partner airline, so make sure you get a saver award. United theoretically only offers saver awards for partner airlines, but can trick you into using more miles for a standard award. Saver awards on partners work like standard awards. Go back to the main search page, search multiple destinations, and plug in the routings you just found. You should be able to book the entire itinerary online. Just double check that you are being charged the correct round-trip redemption rate if you have a lot of stopovers and open jaws. If not, double check that you selected the correct flights. United miles are a great way to get into some very luxurious first-class cabins, most notably Lufthansa, but keep in mind that Lufthansa only opens first class to partners 15 days in advance. Itinerary holds are permitted, but not free. You’ll have to pay around $20 to hold your itinerary for three days. This is a way to lock in a great reward itinerary when you don’t have the points in your account yet. While we often recommend looking close to last minute for award flights, because this is when airlines open up inventory they think they wont sell, United penalizes you for the privilege to the tune of $75. You’ll also pay a $75 fee for ticket changes before 21 days of departure, so United award bookings are best made in advance when you’re sure of your itinerary.